It’s the greatest feeling in the world when your landscape is complete, the trees are big enough to cast a puddle of shade onto the lawn and you can finally relax after the years you’ve spent turning an old drab lawn into a planted paradise. When you notice that sad little plant in the corner, wilted and covered in dark spots, you’ll know it’s time to get back to work if you know how to recognize botryosphaeria canker on plants. Botryosphaeria canker is a common fungal disease of trees and woody shrubs, but it only attacks plants that are already stressed or weakened by other pathogens. Cankering can become quite extensive within the cambian layers, heartwood and inner bark of woody plants, cutting off the tissues that transport water and nutrients throughout the plant. Affected tissues develop black, pimple-like fruiting structures or cankers on bark surfaces. When the bark is peeled back, the wood underneath will be reddish-brown to brown instead of a healthy white to pale green. 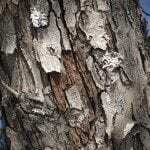 Some trees will weep gummy sap or develop blisters on their bark along with the more obvious widespread wilting of botryosphaeria canker disease. If caught early, localized botryosphaeria canker on plants can be cut out and the entire plant saved. In the winter or very early spring before bud break, prune any branches or canes back to unaffected tissues and immediately dispose of infected debris. Prevent spreading the botryosphaeria fungus further by soaking pruning tools in a mixture of one part bleach to nine parts water for at least 10 minutes between cuts. Fungicides aren’t generally recommended for botryosphaeria canker treatment, since the fungus penetrates tissues, where chemicals can’t reach. Instead, after pruning out diseased areas of the canopy, pay closer attention to the plant. Make sure that it is properly watered, fertilized and protect it from bark damage. Once your plant is again thriving, you can keep it from developing new problems with botryosphaeria canker disease by continuing to provide it with excellent care and waiting to prune until late winter or early spring, when it’s still too cold for fungal spores to take hold while the wounds are healing.